A little while ago, while browsing on Etsy, I come across a store which sells miniature european type pastries and other interesting food. The shop is called 2Smart Miniatures. 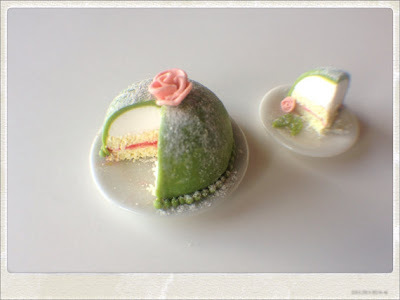 I asked them to make me some typical swedish desserts for my swedish house. They obliged, and the result is great! 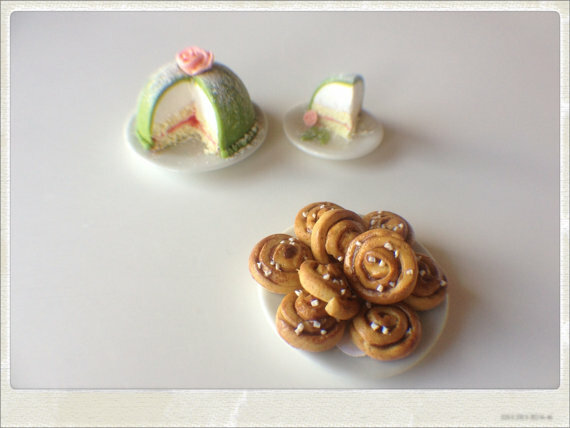 Some bullar, and a princess tort, two typical (and wonderful) swedish treats. Looking forward to placing them on the tea table in the parlour when it is finished! What a lovely color on the cake and the crumbs surrounding it are delightful! 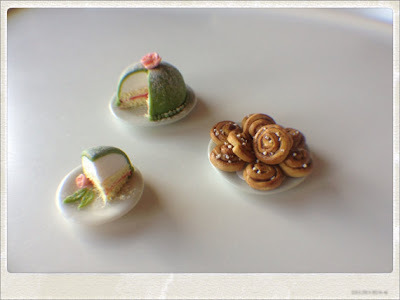 (Now who else but a miniaturist would get excited about cake crumbs?) You have 2 really lovely pieces and I will check out the site that you listed. Your Swedish house will have some very tasty treats during those midnight sun days. Thanks Elizabeth! they will certainly look good in the room. Now I just need to make the room!